The HeatTrak® Industrial Snow-Melting Stair Mat is an electrically heated mat designed to prevent snow and ice accumulation on stairs. The mat plugs into any standard 120V or 240V outlet generating heat to melt snow at a rate of 2" per hour. It is built with flame retardant reinforced SBR rubber and is designed to be left outside for the entire winter season. The mat comes with grommet holes in every corner (and every three feet of length depending on the size) to help secure it in place. Each Industrial Stair Mat has watertight connector cables enabling it to connect to additional Industrial Stair Mats. Up to 13 amps can be connected on a single plug. 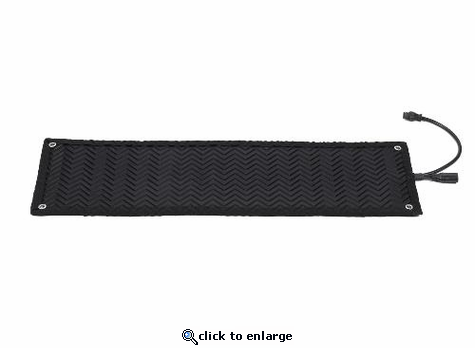 *Important Note: Each set of Industrial Stair Mats requires one Power Unit to connect the system on an electrical outlet. See below. Cord Length Between Stairs: 22"
outside of the responsibility of HeatTrak, LLC under this Limited Warranty. STATUTE, CONTRACT, STRICT LIABILITY, TORT OR OTHERWISE. If the goods are a consumer product in buyer’s jurisdiction, the above exclusion or limitation of incidental or consequential damages and the above disclaimer of implied warranties may not apply. The term of any such implied warranty is limited to the term of this two-year Limited Warranty. Some jurisdictions do not allow limitations on how long an implied warranty lasts, so the above limitations may not apply. This warranty gives consumers specific legal rights, and consumers may also have other rights, which vary by jurisdiction.